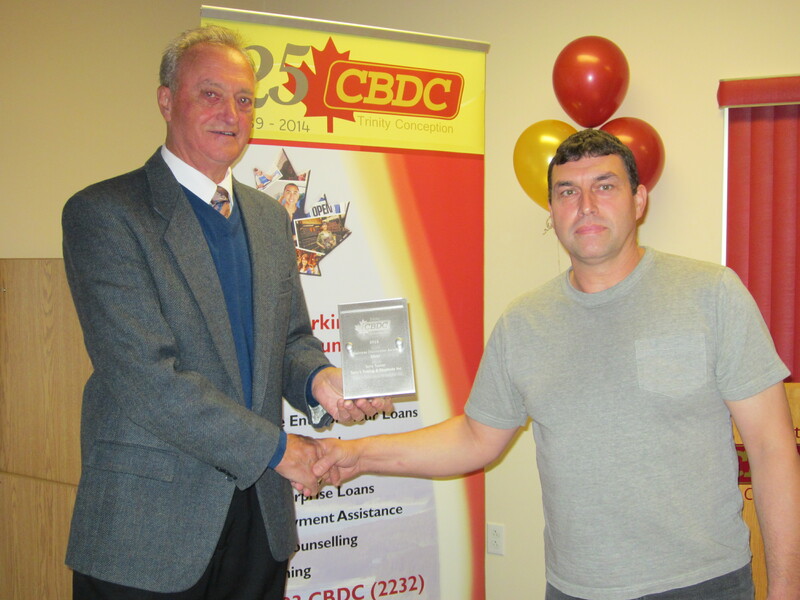 Terry Tucker of Terry’s Towing and Roadside Inc. accepts the 2015 Business Distinction Silver award from Ray Tuck, Chairperson of CBDC Trinity Conception. The awards were presented at the Annual General Meeting held on October 20, 2015. In the spring of 2010 Terry Tucker of Makinsons, NL was employed full time as a mechanic at a local garage in Conception Bay. He approached CBDC wondering about financing options for him to purchase a tow truck to provide roadside assistance in his spare time. He hired a part-time driver to help him fill his contracts but by the end of that first summer it was clear to Terry that this was a full-time business in itself. He left his place of employment and became a full time entrepreneur. In 2011, after a very successful year, he expanded the business with the addition of a second tow truck and a commercial closed-in trailer equipped to transport luxury vehicles out of the province for repairs. The business continued to grow with the addition of 5 flat beds and a van for local business calls. In 2014, again with the assistance of CBDC Trinity Conception, he purchased a newer tow truck and closed-in trailer and expanded his business outside of the Conception Bay area to St. John’s. Terry employs himself full time and 2 seasonal employees. He has increased sales by 528% in his four years of operation. CBDC Trinity Conception congratulates Terry on the success of his business over the past 4 years and looks forward to working with him in the future.